Sadie is currently, kneeling across the room from me, praying the rosary along with her Holy Baby DVD, in her full "Marie Therese" regalia. She's told me about five times today that she's going to be a nun, and begged me to search for her nun outfit and help her squeeze into the veil, which is now way too small, before asking to watch her "Marie Therese" movie. I know the movie she means. She wants to watch "Therese", but since I've noticed her terror of me dying seems pretty directly linked to us watching that movie, we're avoiding it until she's a bit older. We've continued reading the Catholic Children's Treasure Box books, which talk about Saint Therese praying a lot, and apparently are having quite the effect. Today's book talked about Therese kneeling while she prayed and now Sadie is enthusiastically kneeling, which I hope will carry over into Mass (I bet it would if I let her wear her nun outfit). In other happy news, January is apparently a good month for headcoverings! I was nearly finished with the six headcoverings I'd been working on for orders earlier this week, when six more headcoverings were ordered yesterday! If this keeps up, I might actually be able to start paying off bills, which would make me very, very happy! I went and bought three yards of fabric for my most popular snood, after selling out a second time, and was happy that the print was still in stock. Three yards makes around nine snoods, a few convertible headcoverings, with enough fabric left over headbands too, so that ought to keep me busy for a while! Sadie's even asked for a black and white snood, one of those rare instances where something doesn't have to be "Pink!!!!" To stress the importance of "pink" in her life at the moment, I'm slightly surprised that she hasn't demanded a pink "Marie Therese" dress. When she saw the red velvet dress I'd made for Christmas morning one of her first comments was: "I wish it was pink!" Ah yes. There is an awful lot of pink in our world these days! We're also readjusting to Paul being back in school. I think this is the craziest semester in law school and so we've pretty much said goodbye to seeing much of him until mid-May. Thankfully living on campus means that we at least get to sit down to lunch and dinner as a family, and I've very grateful for that! I think we've just about adjusted to the new "normal" at the moment! As long as we don't have any more disasters!!! 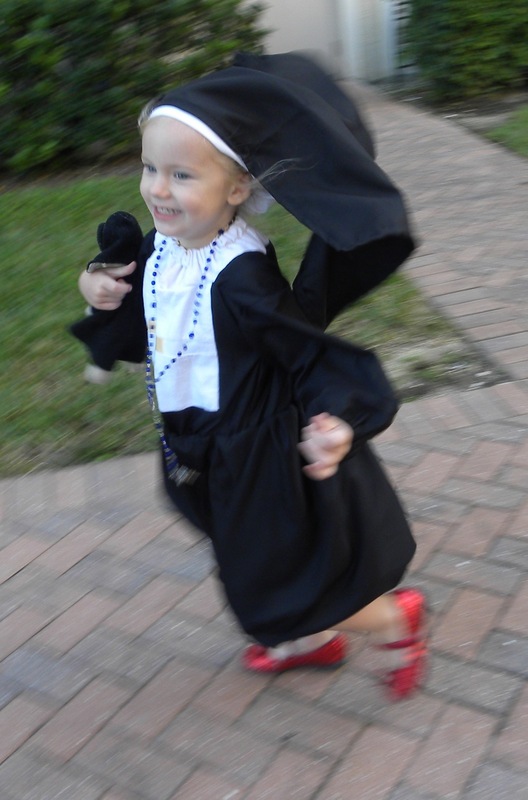 Sigh, wish I had been Catholic when my daughter was little like Sadie. I would have loved to give her a nun's dress, etc. How sweet! I accidently removed your entire comment, when I tried to remove your email address! Apparently "remove content" means the entire comment! That's good to know! I will answer your question here (for everyone else, it's about how fitted the snoods are). Pretty much all the snoods on the shop are the same fullness, with the exception of stretchy velvet ones. But I absolutely can customize the fullness and make them better suited for someone who doesn't have super long hair or a giant bun (in my case it's the bun, because my hair isn't all that long!) that doesn't want to back to look too pouffy. So I'll make your snood that way, using just a little less fabric from front to back so it's more fitted! I can't do it with all my snoods, because I don't have the fabric for everything on the site, but I absolutely can do it for the snoods that I have fabric for (I try to buy a stockpile so that I can make several of the same one). Actually I should probably post that on my store and my blog now that I come to think of it, so people know they can order them that way! Thank you for the quick answer! I will try out the snood I ordered, and see how much extra fabric I have (shoulder length hair) and go from there. One other question I had when ordering... you have three different Etsy Shops. If I want to order items from two different places, is there a way to do that and have everything combined to lower the shipping? Definitely! I can do a custom order and combine everything so that you don't have to pay the full shipping on both shops and you can buy everything in one place! That's great. Would I just contact you through an Etsy shop to arrange that? The fastest way is either through my snood shop (because that goes straight to my normal email) or through my blog email: thiswomansplace@gmail.com . My prayers for you all to have an uneventful semester. I loved graduate school but it was a lot of time and work.